I feel like we’ve reached a dead end with rhythm games. I mean, there’s only so many times I can press color coordinated buttons scrolling down a track. 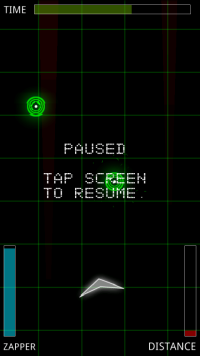 However, games like Rez and Android’s Pulse Rider give me hope; it’s nice to see people being smart about their rhythm. 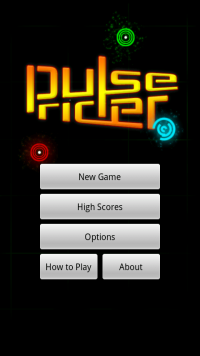 Pulse Rider is a rhythm game for Android that uses the phone’s accelerometer to navigate a player’s starship by tilting. Travelling through the game’s play area, you steer said ship left and right through a field of different emblems, each with its own function and meaning. 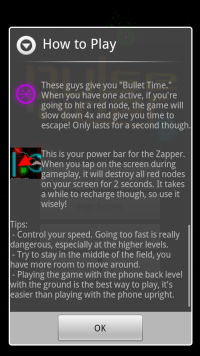 The most plentiful nodes are green, which speed you up and add to your score. 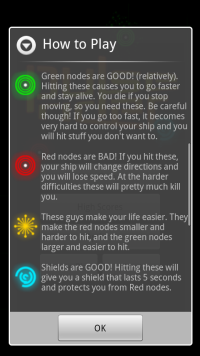 Red, on the other hand, slow you down and decrease your health. Numerous other colours (purple, blue, etc) manipulate the playing field, like making the green nodes bigger and the red ones smaller. The graphics are very reminiscent of the Geometry Wars games, relying on simplicity and vivid colors to increase awareness. Your primary objective is to, well, survive to the end of a time limit and to have a high score; pretty standard rhythm game fare. 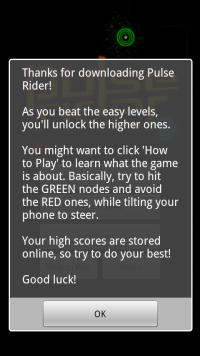 What makes Pulse Rider unique is that every node affects the game soundtrack in some way; they’re placed algorithmically, ensuring that no two “levels” are the same and that each node will add their sound effect to the playing field’s music. This makes for a surreal experience, as you don’t notice this right away: you’re too engrossed in getting some orbs while missing others. However, slowly, you begin to pick up on it; those green orbs are placed close together for a reason. The game moves fast. Very fast. So fast that orbs have their own “trail”, alerting you to their presence before you’ve reached them and giving you (not so) ample time to get in position. The action quickly becomes blistering. Your only respite is touching the screen, which uses up a gauge of energy and eliminates all negative orbs for a short time. This is a great feature, but sometimes becomes a hassle when you might brush the side of your finger against the screen. I’d recommend the developers to possible add an on-screen button instead of relying on the all-too-sensitive touchscreen. Other than this, the game’s only caveat is that the difficulties are very misleading; starting on “Very Easy”, and unlocking a new difficulty every time you complete a level, the learning curve on this game is immense. I quickly lost the tendency to go for every orb, and sometimes thought of gaining points as negative thing – it would only make dodging that next bank of red icons all the more difficult. Pulse Rider is the kind of game you want headphones on to play – it’s great for the subway or other transit, where you’re free to zone out and enjoy the assault on your ears. There’s an option to turn both the sound effects and music off, but this seems to defeat the point entirely. It’s a worthy addition to any Android at $2, with the paid version allowing access to its “Survival” mode, which allows players to ride until they die, free of time limits and music without copious amounts of synth. Matt Demers is a Toronto writer who is incapable of hitting the orange button during Rock Band; whether or not this is an insurmountable barrier remains to be seen. You can find his work on his personal site.